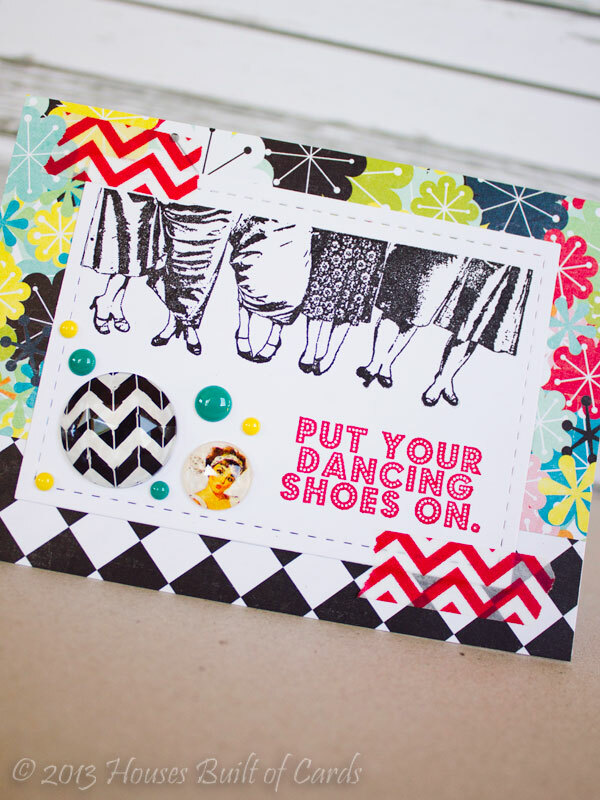 Joining Eyelet Outlet Design Team!!! 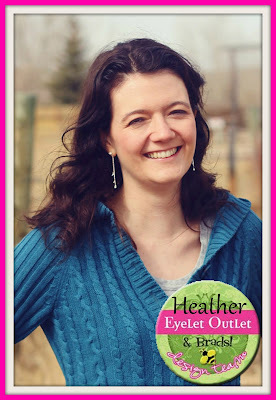 So happy and excited to finally be able to share - I was recently invited to join the Design Team over at Eyelet Outlet. You can read the announcement HERE. 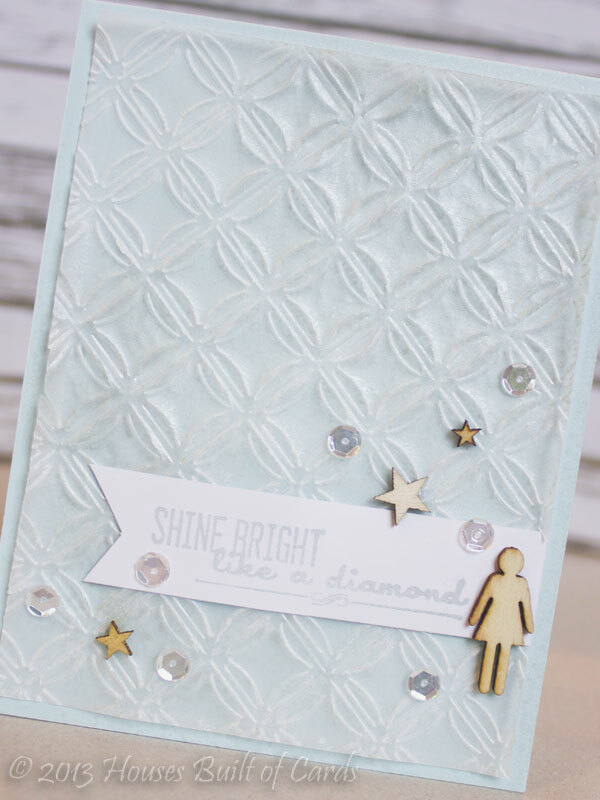 Eyelet Outlet carries tons of adorable brads and eyelets, as well as lots of beautiful bling and pearls and one of my favorites - washi tape! 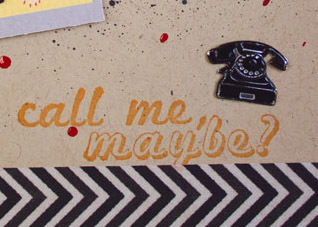 In fact, there is a chance right now to WIN some of the new washi tape! Go check it out HERE!!! Here are a couple little peeks at a few of the projects I have been making with my fun new eyelets - will be sharing more details on them soon! Thanks for stopping by! 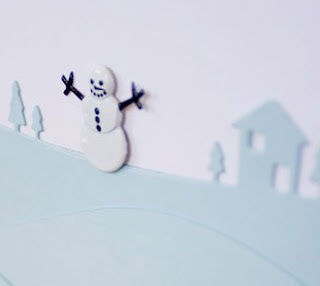 I have a bit more exciting new to share tomorrow with you! Fun times! Good morning! 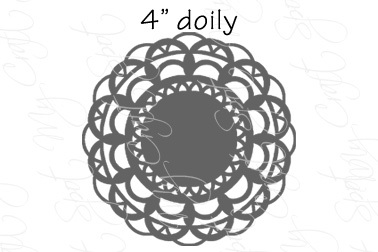 Today is the 3rd day of my week of Growing in Unity for Unity Stamp Company! In case you don't know how it works, make sure and leave a comment everyday for a chance to win 2 Unity Itty Bitty stamps of your choice at the end of the week. I will draw a winner from comments left throughout the entire week. LOVE LOVE LOVE how this one came out! I'm kind of thinking about keeping it - seriously! I used a fun Itty Bitty called "happy to be me" - something about silhouettes always makes me happy I guess! 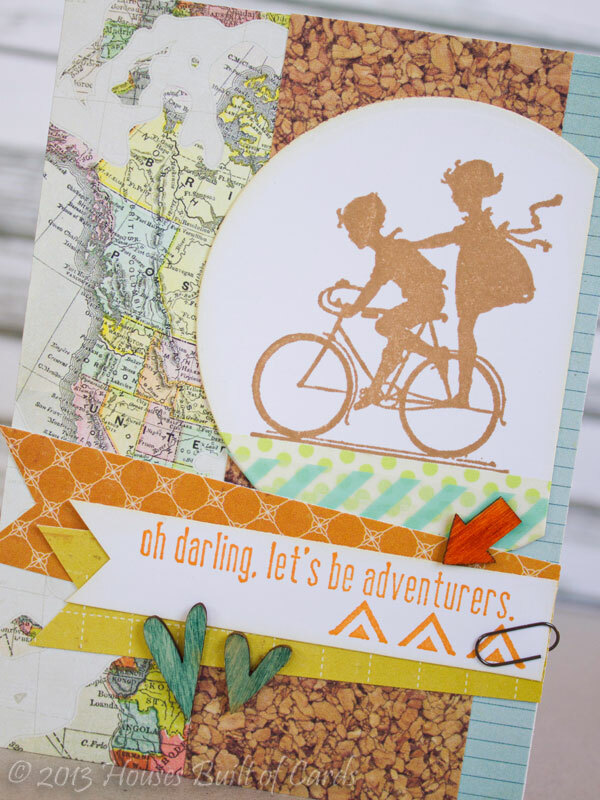 I stamped it with MFT ink on a circle cut with a Spellbinder's Die and trimmed off on the side to make it flat. 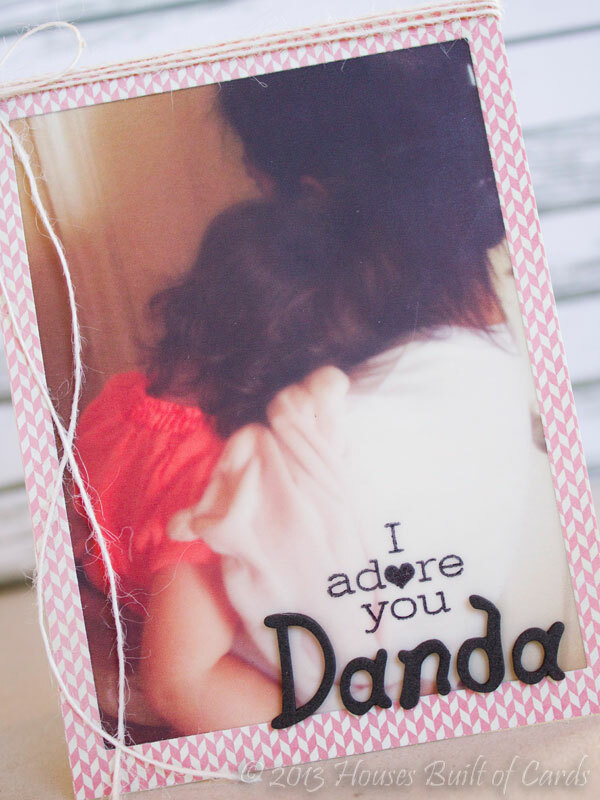 Added some layers of washi tape underneath the image as well. All my pattern paper is from an older Crate Paper paper pad - Story Teller. 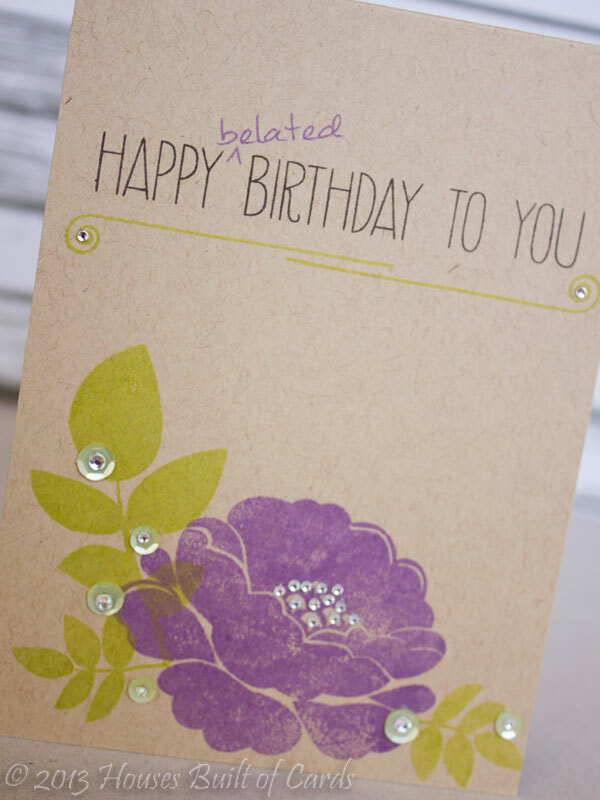 I trimmed the banners by hand, stamped my sentiment with MFT inks, and added a Tim Holtz paper clip on the side. Finished off with some Studio Calico Wood Veneer shapes that I colored with Copics to match my project. And the next one is totally bright and fun! 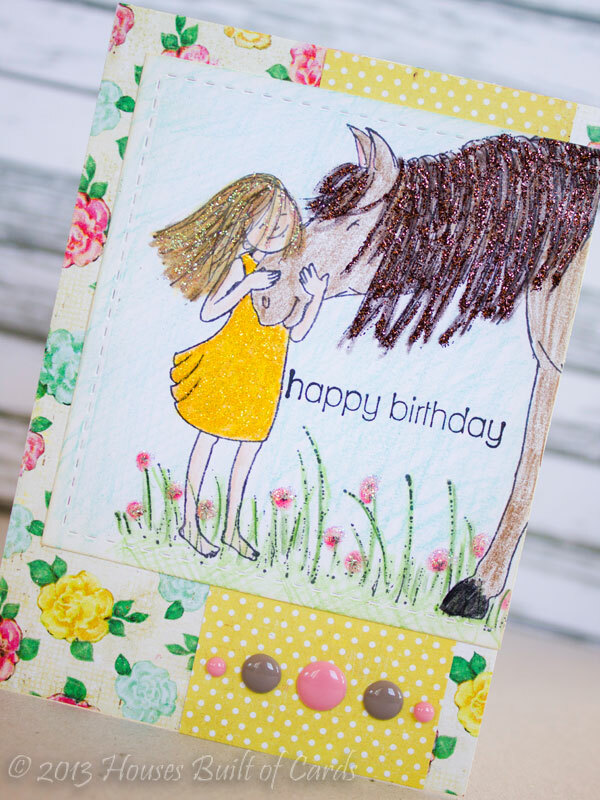 For this one I started off by cutting a circle with a Spellbinder's die in a piece of cardstock, then using the negative piece as a mask and blending some different colors of Tim Holtz distress ink in sunset colors. 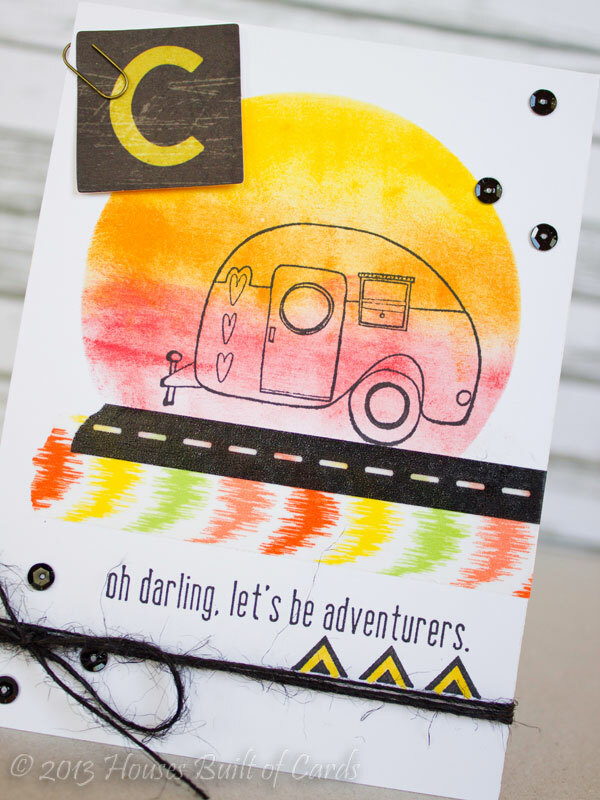 Then I stamped the Itty Bitty Destination Happiness over the top of it. 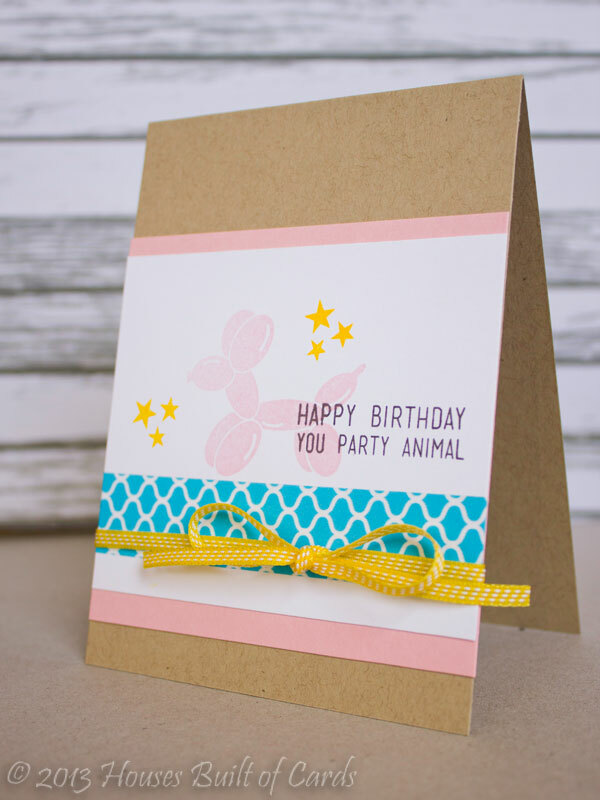 Added some washi tape underneath, stamped the sentiments and colored a bit of it with Copic markers, and tied on some jute twine. 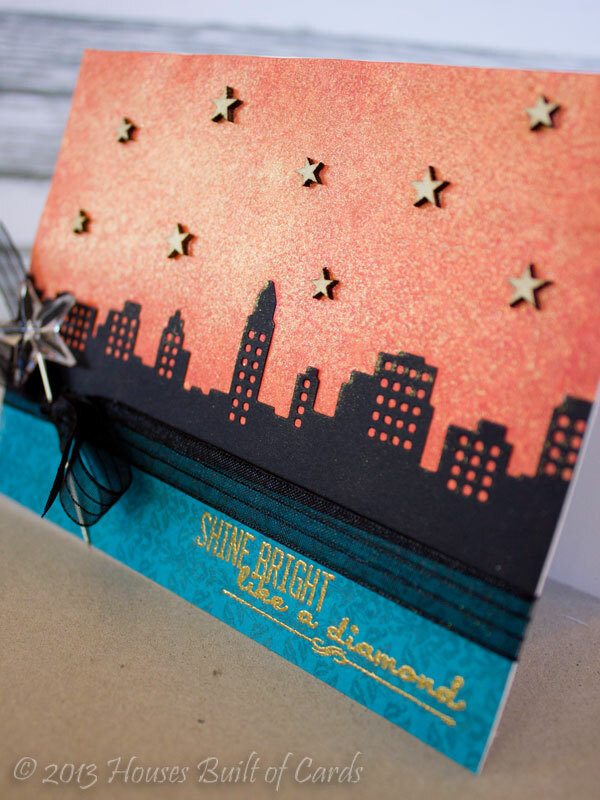 Added a few sequins, and a little bit of ephemera from Crate Paper and a Tim Holtz paperclip. 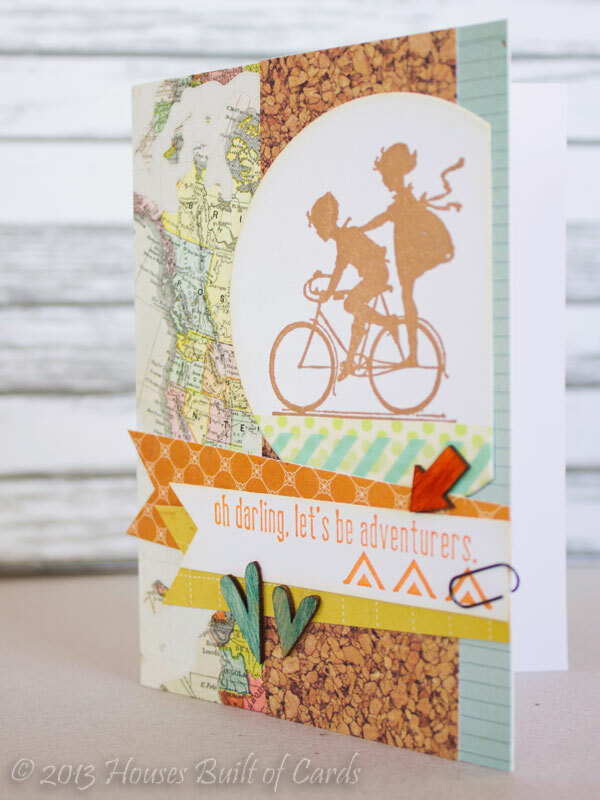 I am also linking these up to this weeks Simon Say's Stamp Challenge - Anything Goes! That's it for today! 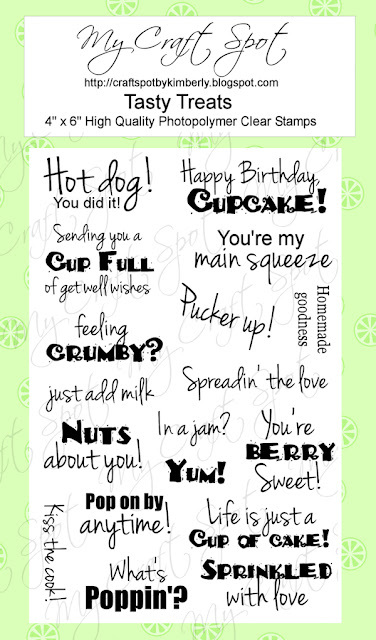 I'll see you again tomorrow for two more cards using another sentiment! Have a great day!!! Good morning! 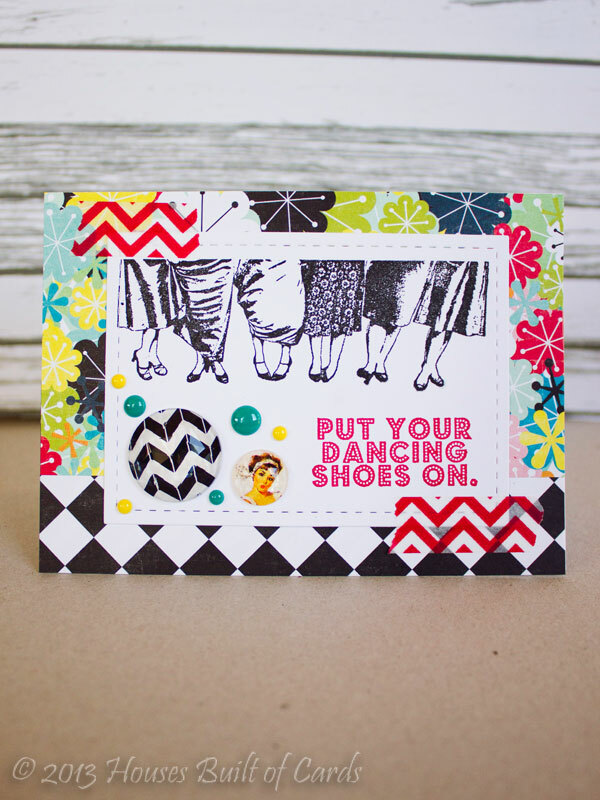 Today is the 2nd day of my week of Growing in Unity for Unity Stamp Company! In case you don't know how it works, make sure and leave a comment everyday for a chance to win 2 Unity Itty Bitty stamps of your choice at the end of the week. I will draw a winner from comments left throughout the entire week. 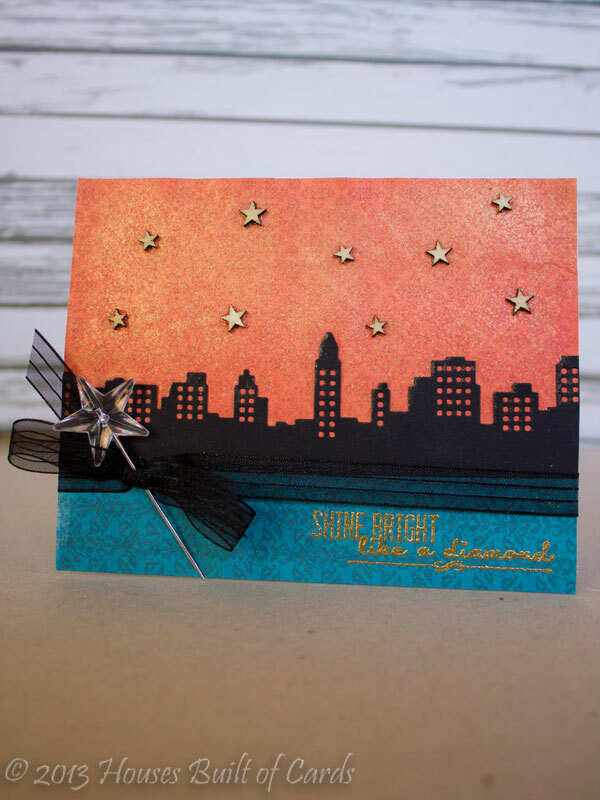 I went bold and strong for this one by cutting the city skyline out of black paper with a MFT Die-namics Die. 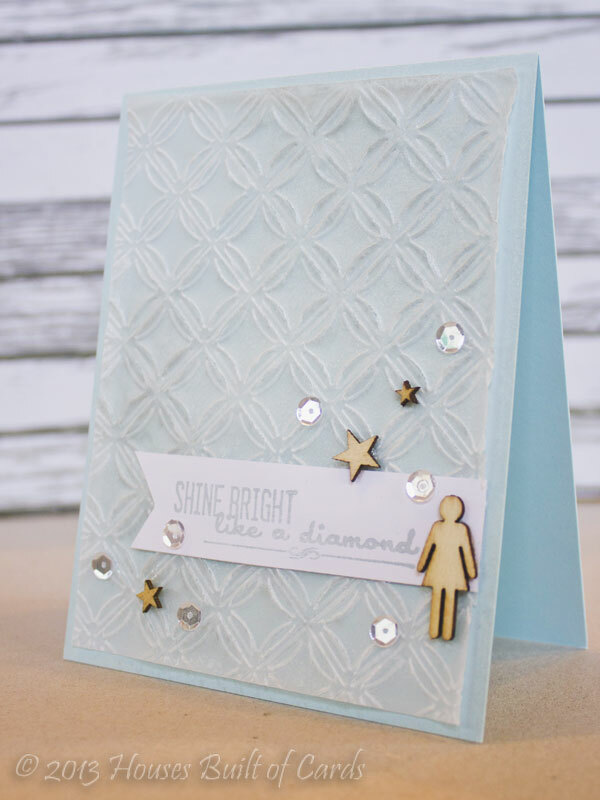 I layered it on some MME paper, and spritzed it well with Gold glimmer mist, and then heat embossed the sentiment on the bottom with Gold Zing embossing powder. Added some black sheer ribbon, a stick pin, and a bunch of Studio Calico wood veneer stars. 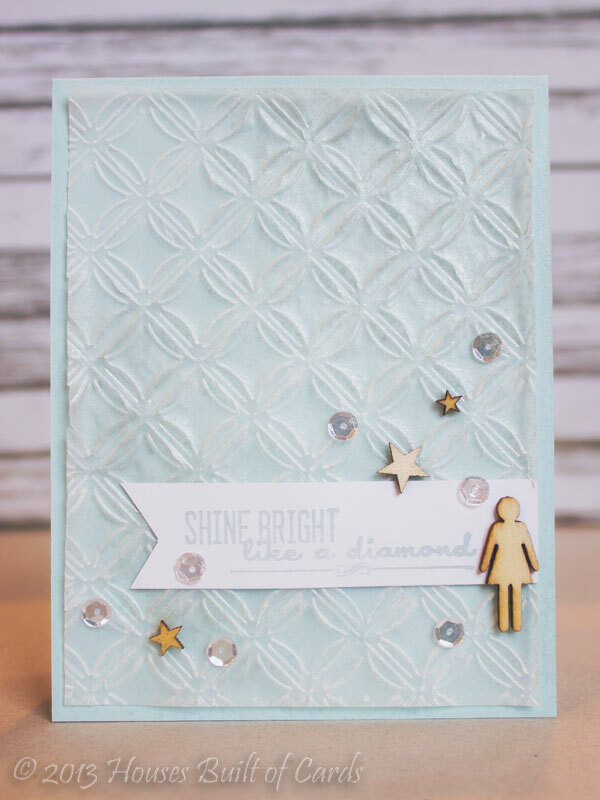 I started off by embossing a piece of vellum with my Cuttlebug, adhering it to some Avery Elle Cardstock, and then spritzing with some Silver glimmer mist. I made the edges curl up a little, but I love the pretty effect it gave! Once that dried, I added my sentiment stamped on a hand trimmed banner, some more wood veneer, and a few sequins to finish it off. Good morning! 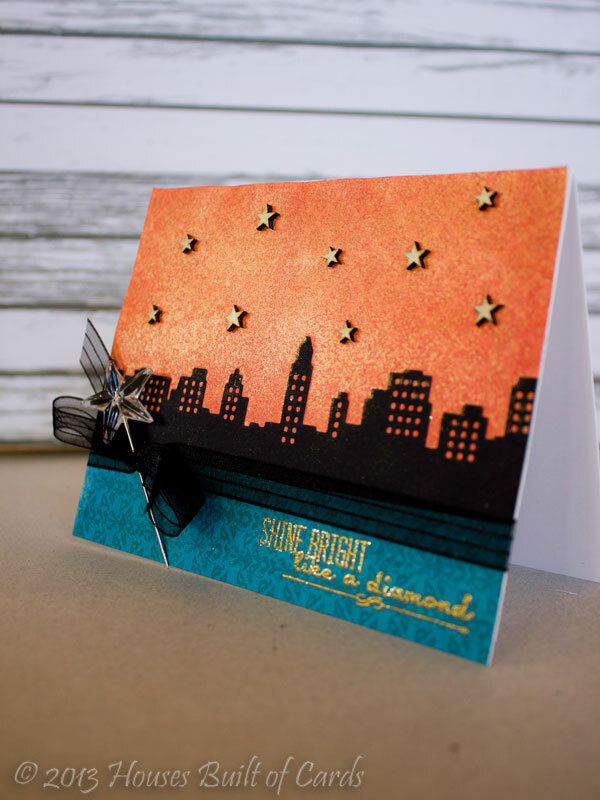 I'm excited today to be starting of my week of Growing in Unity for Unity Stamp Company! In case you don't know how it works, make sure and leave a comment everyday for a chance to win 2 Unity Itty Bitty stamps of your choice at the end of the week. I will draw a winner from comments left throughout the entire week. 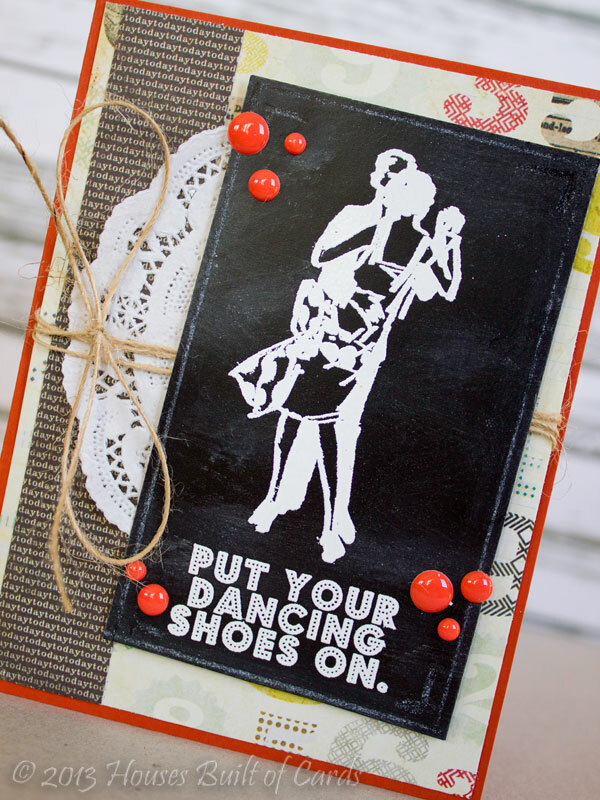 I also used an Itty Bitty stamp called You Sweep Me Off My Feet, and went for a chalkboard style stamping effect. Used pattern paper from Crate Paper's DIY Shop 6x6 paper pad, PTI Cardstock for the cardbase, tucked a doily and some jute twine behind the chalkboard panel, and finished off with a few enamel dots. 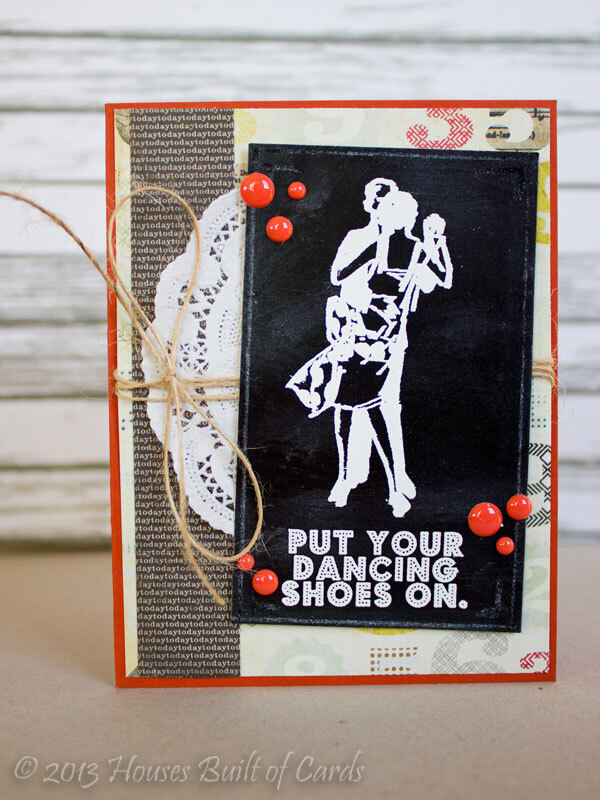 For this one I used an image from the July 2012 KOTM, stamped it in black on a rectangle cut out with my Lil' Inker's Stitched Rectangle Dies, and then stamped the sentiment using MFT ink. That's it for today! 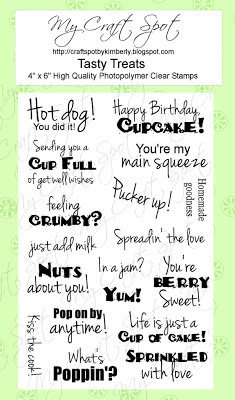 I'll see you again tomorrow for two more cards using another sentiment! Have a great Monday!!! 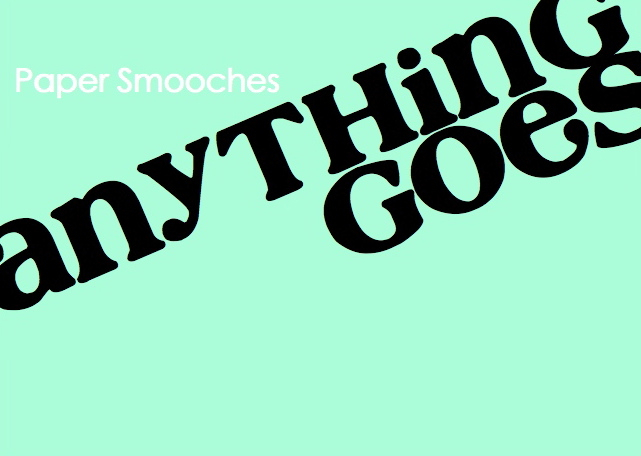 PS SPARKS Anything Goes - Thanks Bunches! 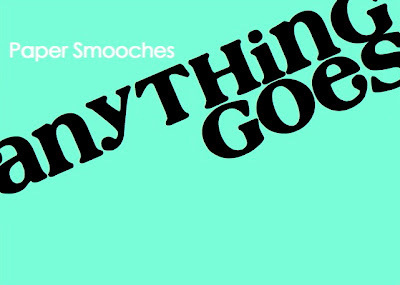 Since this is the 5th challenge date in July, it means it is anything goes! 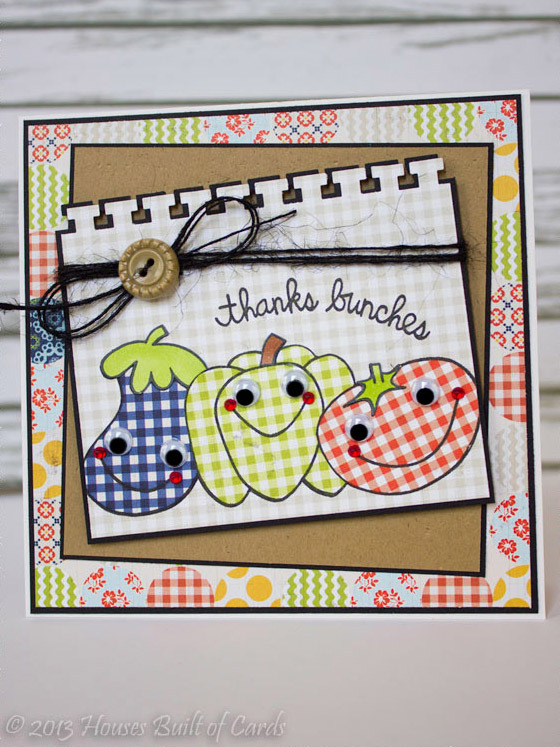 I used Vegtastic stamp set to layer and paper piece my vegetables using a Lily Bee Designs 6x6 paper pad. 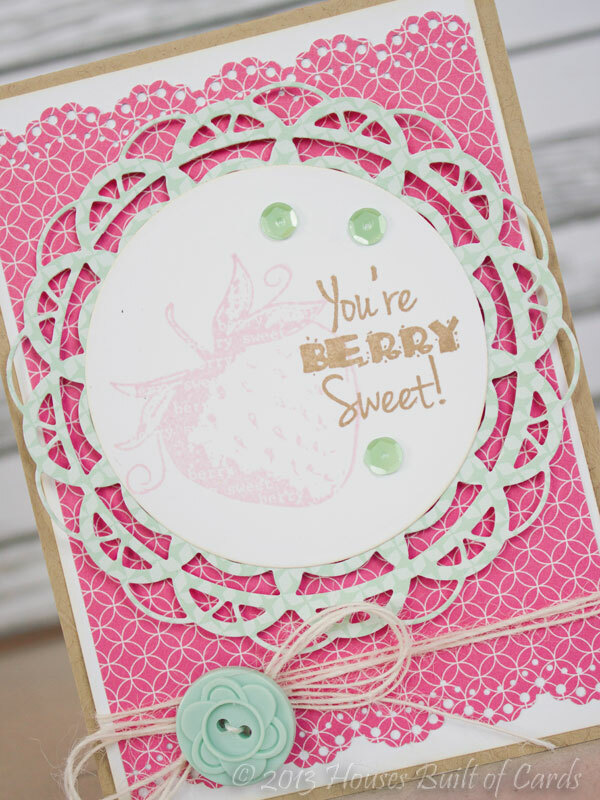 I added the sentiment by curving it on my clear block before inking and stamping. Top edge is cut with a Fiskars Edge Punch. 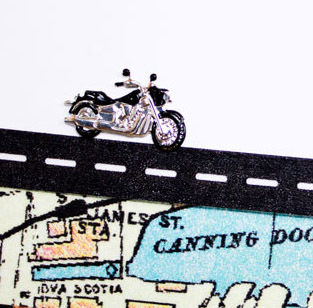 I added lots of layers of matting on this one too! 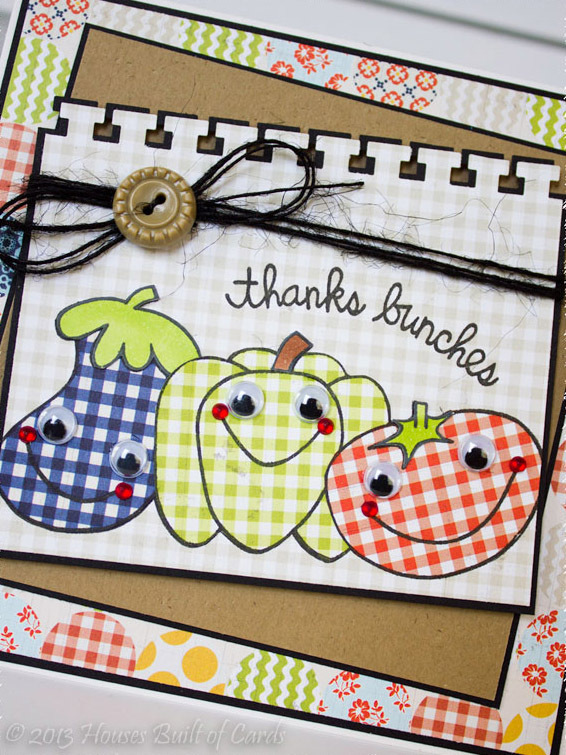 Added the wiggly eyes because they are so fun, and finished off with some jute twine and an October Afternoon button. 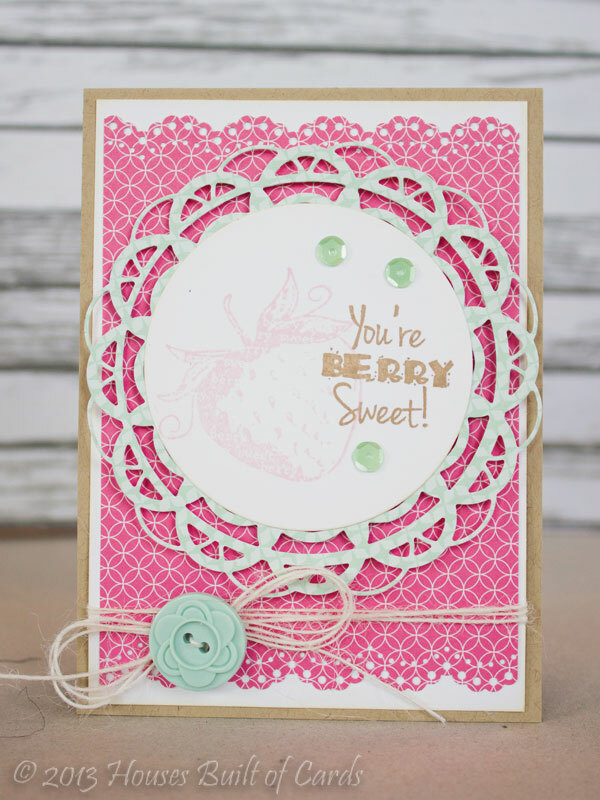 I cut the doily die using some pattern paper from Echo Park, and then used a circle Spellbinder's die for the center. 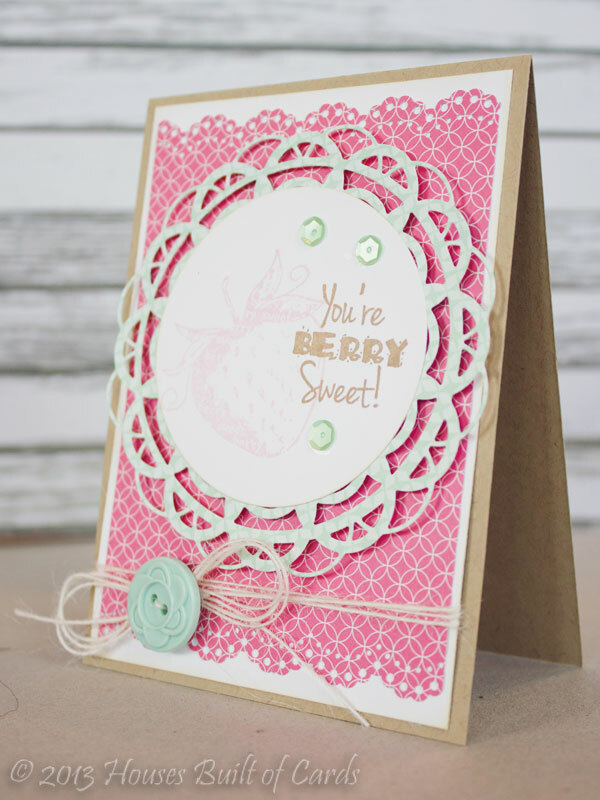 I stamped the strawberry from a Unity Stamp set using MFT ink, then stamped the sentiment over the top with kraft MFT ink. 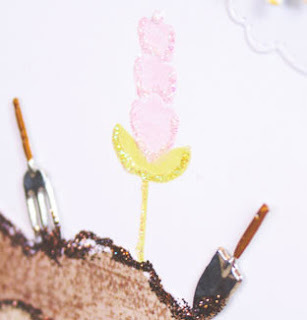 I inked the edges with distress ink, then added a couple of sequins from Neat and Tangled. 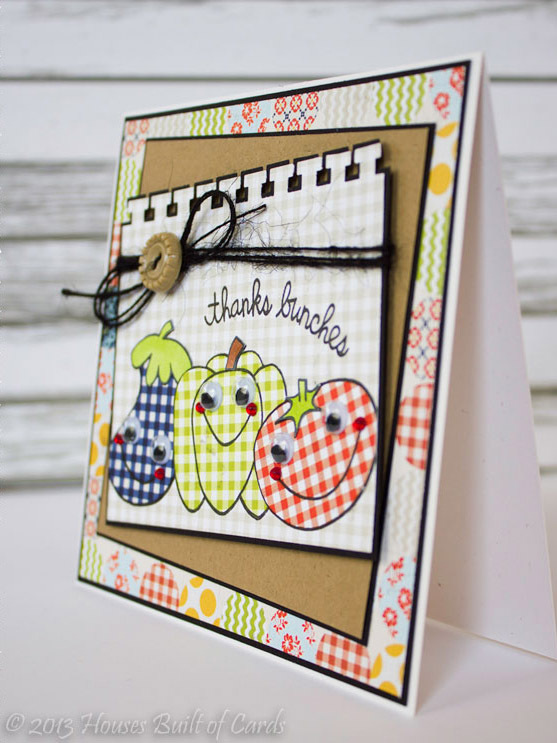 I trimmed some more pattern paper with a Martha Stewart border punch, matted in white cardstock, wrapped with the jute twine and tied in a bow with an October Afternoon button, then attached to an Avery Elle kraft cardstock cardbase. 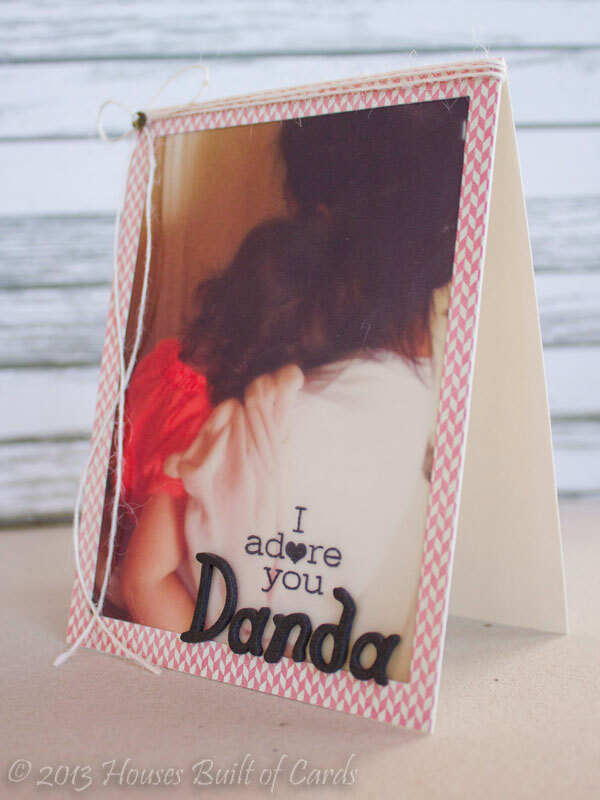 I don't have a printer that does a fabulous job on photos, and no place local (that I know of) where I could get prints made. I was heading out of town and didn't have time to order and wait for it to come in the mail, so I had to get a little creative. So...I printed the photo on vellum! Worked perfect - gave it a soft and dreamy look that was hard to capture in these photos, but it really came out beautifully! The pattern paper is from Basic Grey. I cut a window in it, then mounted my vellum on the backside. Finally, mounted it on a soft cream cardbase. 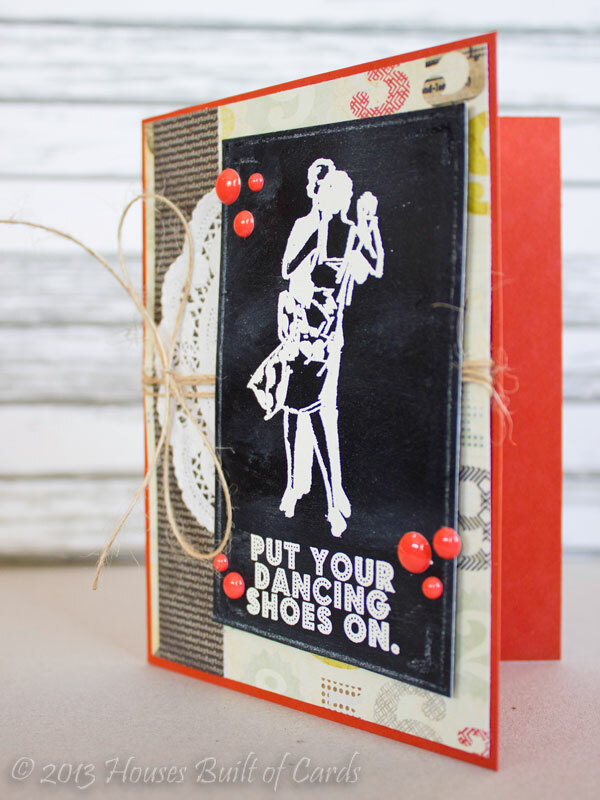 Stamped the sentiment from Avery Elle with Stazon ink, and added the name with Thickers. Finished off with a bit of jute twine wrapped around the top and tied in a bow, with a tiny dab of glue in a couple of spots to let it drape down pretty and land where I wanted it, and a tiny self adhesive bling in the center of the bow. 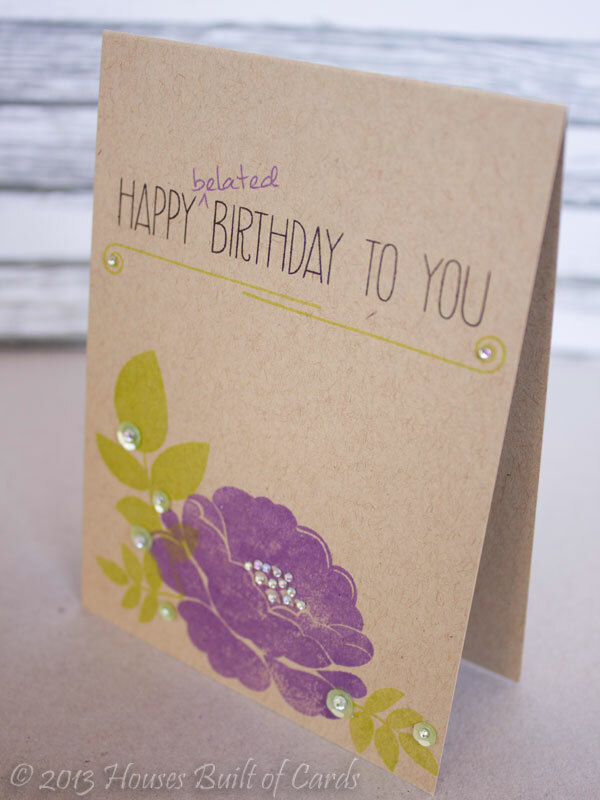 For this card, I stamped the flower, leaves, and sentiment directly on kraft paper with colored inks. 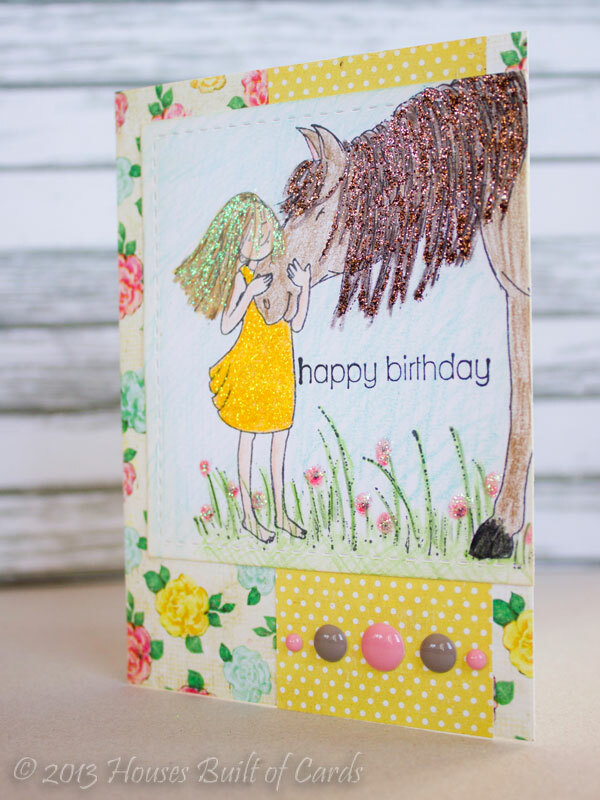 Love how it softens the colors and gives it a soft pretty look! 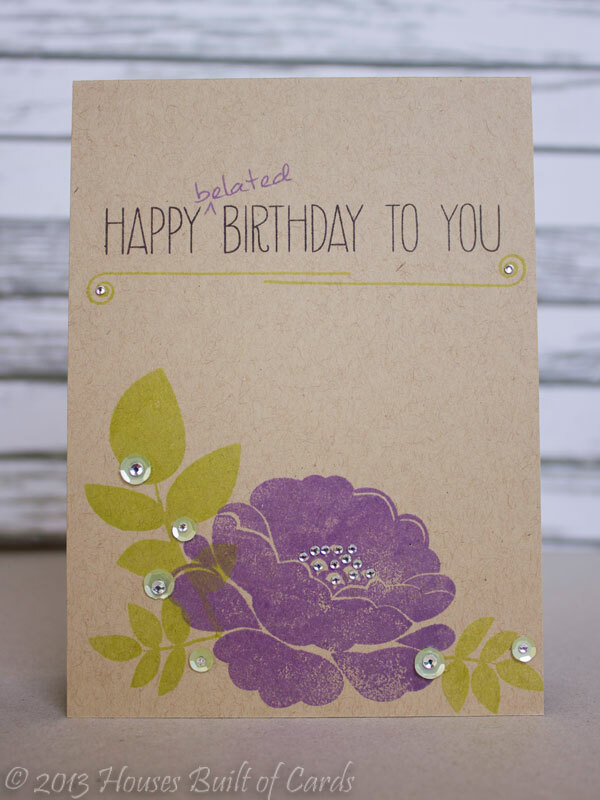 I used MFT inks, and added some sequins, and a bit of bling. 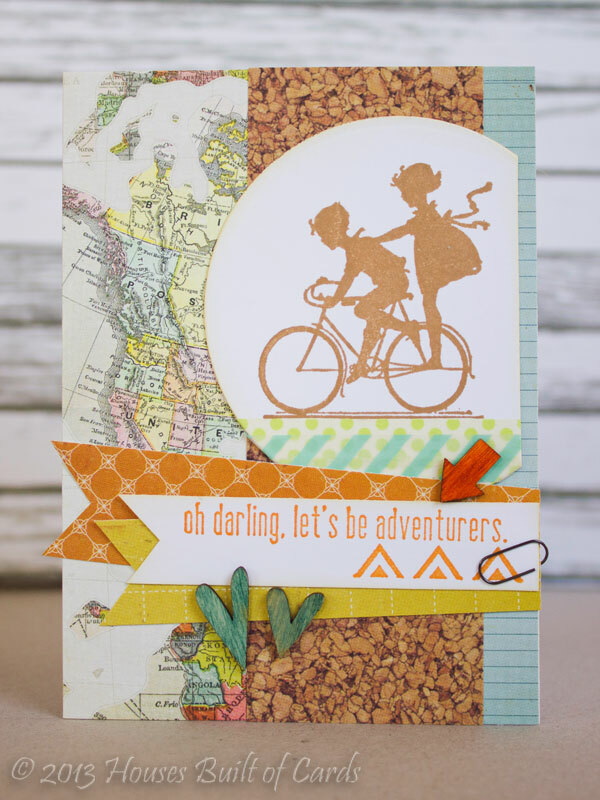 Cardbase is Avery Elle kraft cardstock - one of my current favs! 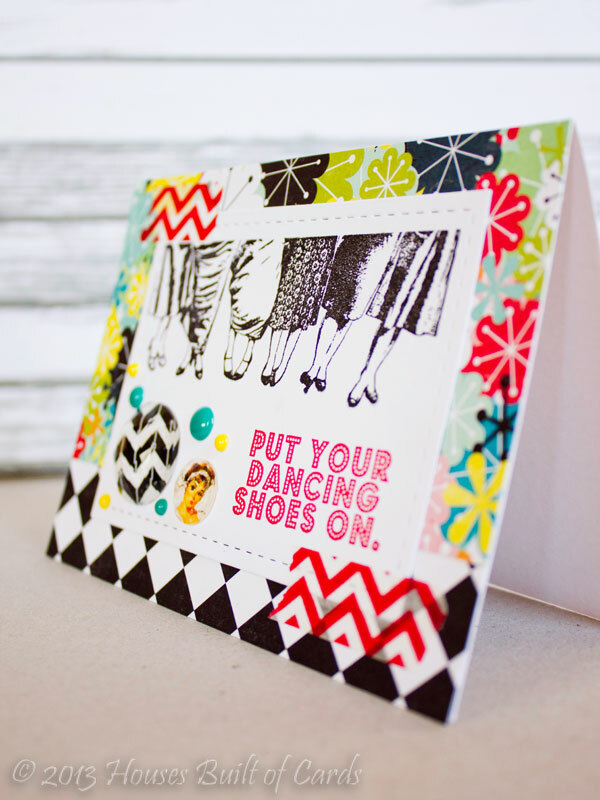 I used some pretty pattern paper from Crate Paper's Little Bo Peep 6x6 paper pad. 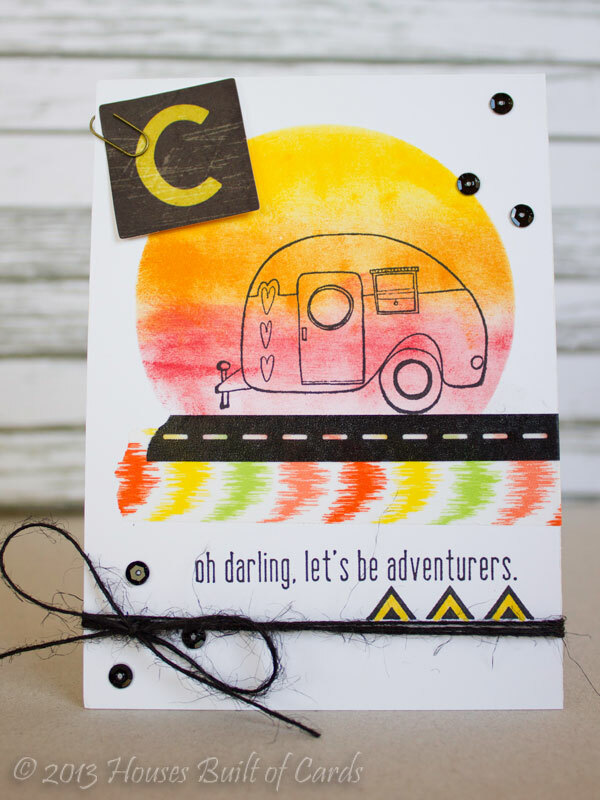 I used Bazzil White cardstock, cut with a Lil' Inker's Die for my Unity Stamp image and sentiment, and colored it in with colored pencils. 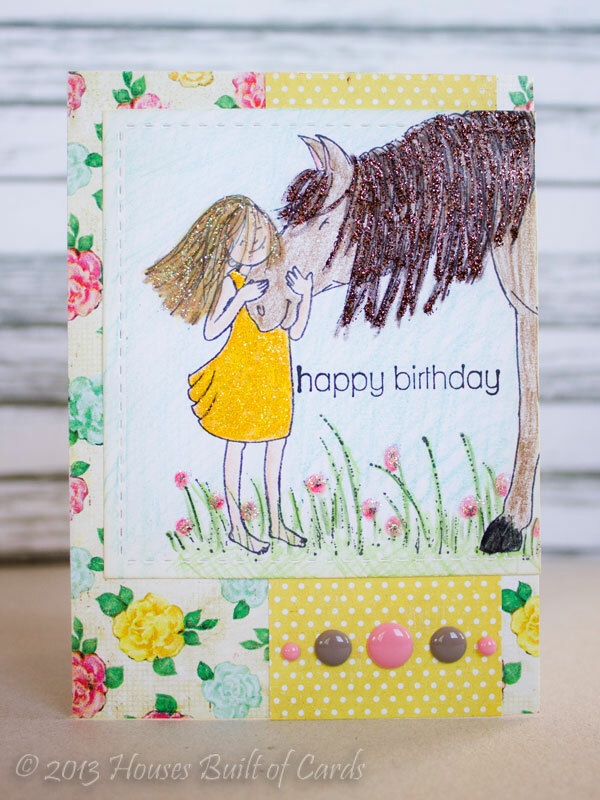 I also added a few different colors of Stickles to the flowers, hair (girl and horse! ), and dress. 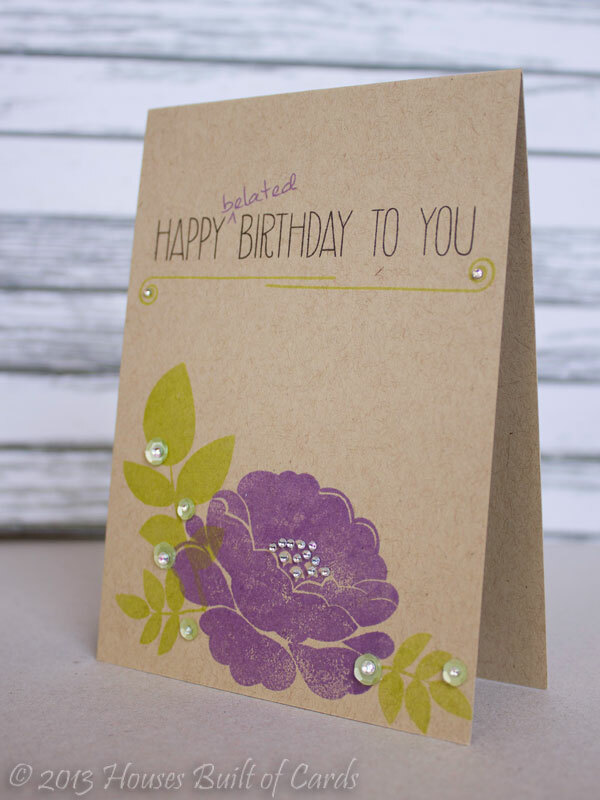 Finished off by using distress ink on the edges of the cardstock to soften it a little, then added some MME enamel dots. Thanks for stopping by today! Have a wonderful day!!! 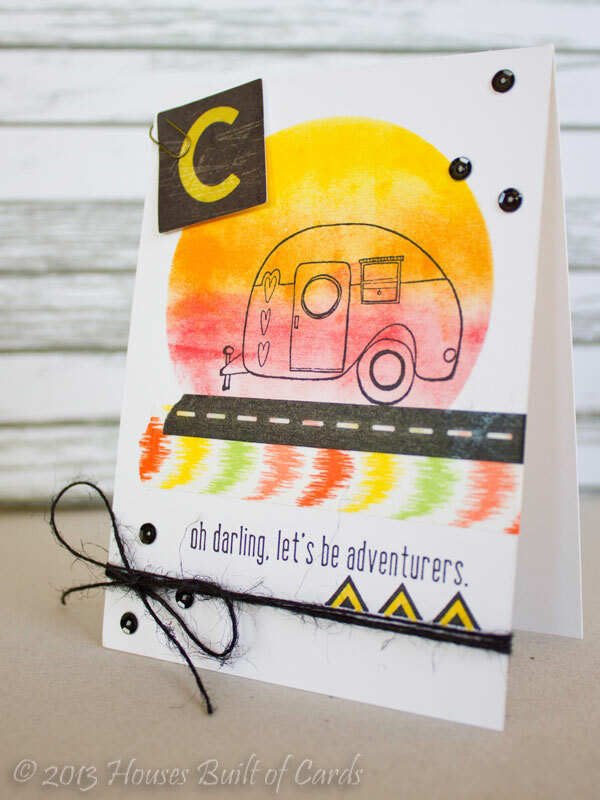 MCS Challenge - Sew Fun! 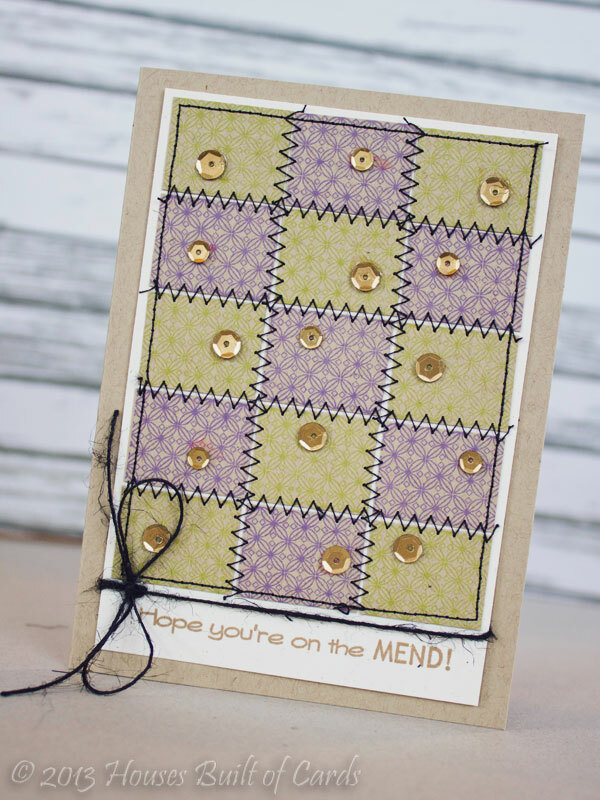 I used 2 stamp sets: Pattern Blocks and Feel Better Soon, as well as Black Jute Twine from My Craft Spot. 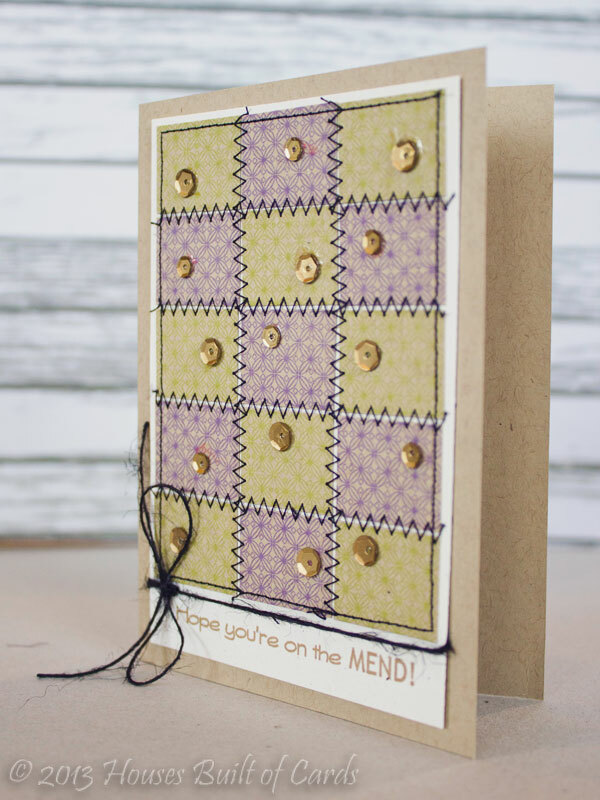 I stamped the pattern blocks on kraft paper using MFT inks for a softer and more subtle color, then cut each one out, attached to some plane cardstock in a fun pattern, then took it to my machine and added my stitching to make it look like a patchwork quilt. 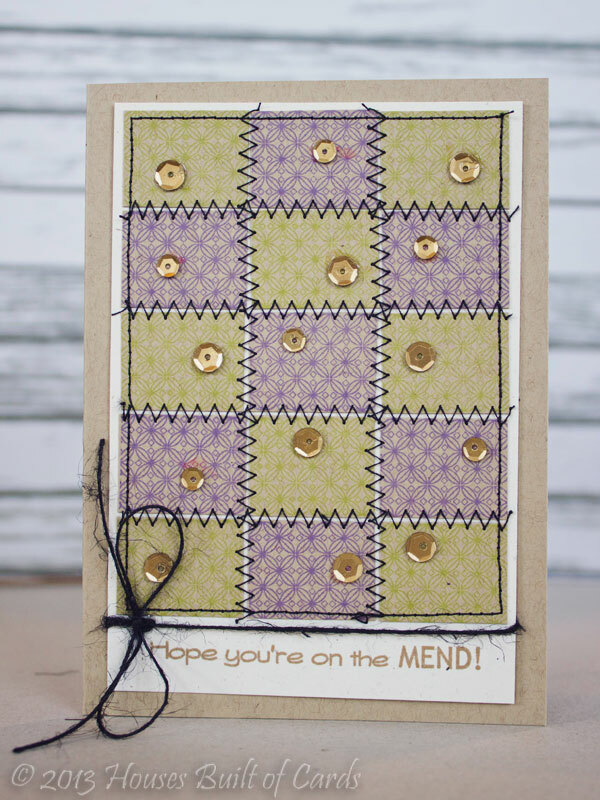 I added some jute twine on the bottom, and then a random sprinkling of sequins across the quilt, and stamped my sentiment on the bottom before attaching to a kraft cardbase. I hope you will join us in the challenge this week! Can't wait to see all of your creations! 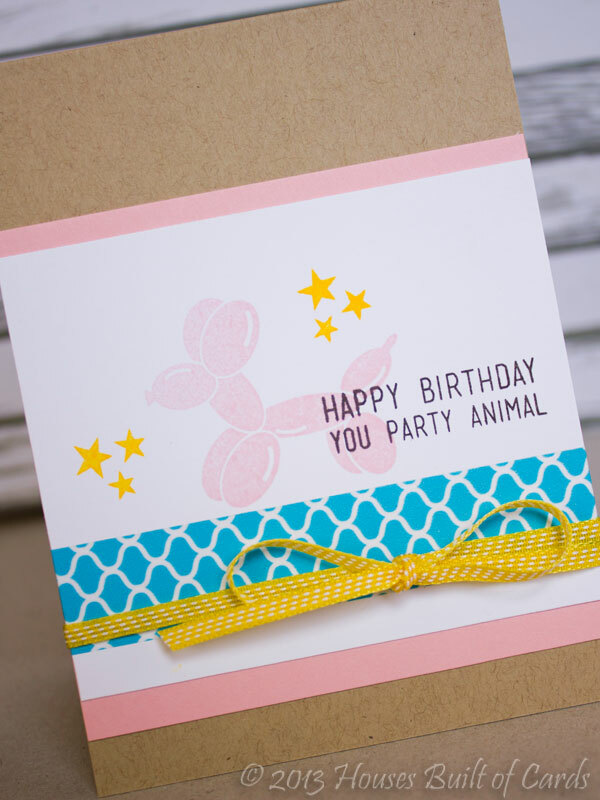 I love this fun Party Animal stamp set from Avery Elle so much! 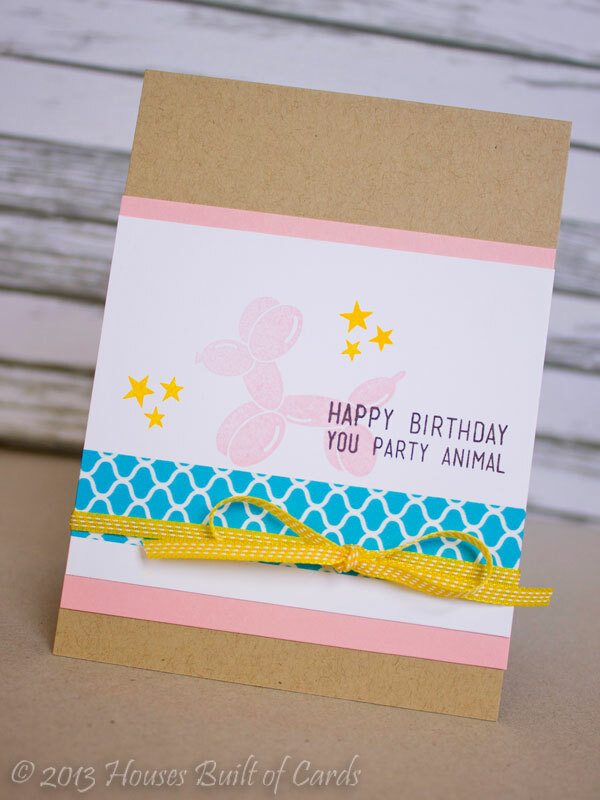 I stamped it with MFT inks on white cardstock, then added a strip of washi tape underneath. 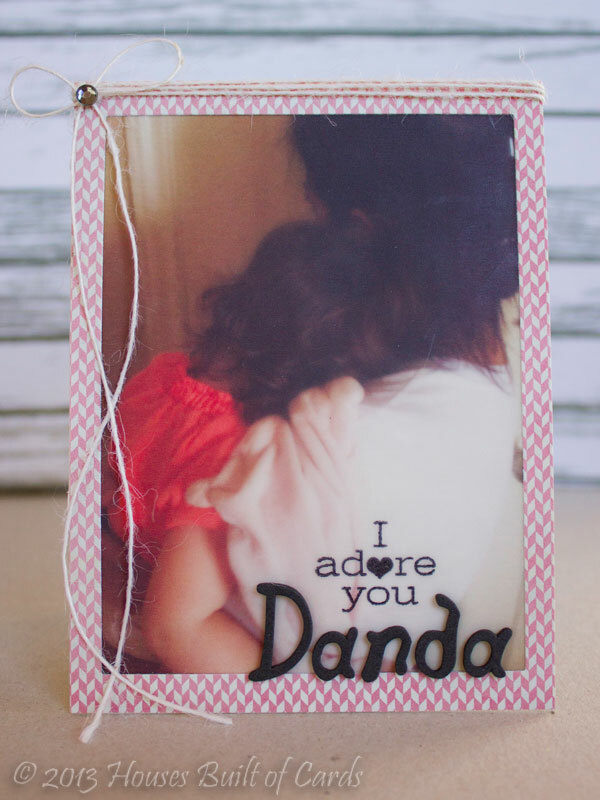 Matted it with MFT pink cardstock, then attached to my Avery Elle Kraft cardbase. Finished off by wrapping some May Arts ribbon around and tying in a bow. Thanks for stopping by today! Have a fabulous day!!! MCS Challenge - Wrap it Up! 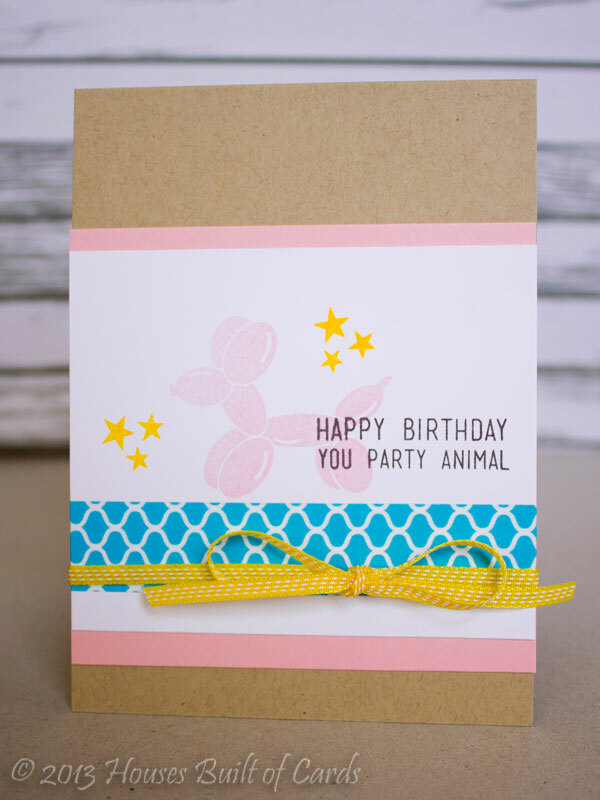 My Craft Spot Release Party WINNER!